Two Bears Farm and the Three Cubs: Muffin Tin Monday - Blue and Purple. Plus, What the heck is a Chicken Tractor? Muffin Tin Monday - Blue and Purple. Plus, What the heck is a Chicken Tractor? Today is Muffin Tin Monday. The theme is blue and purple. Tricky, tricky! We managed to create a tin though. 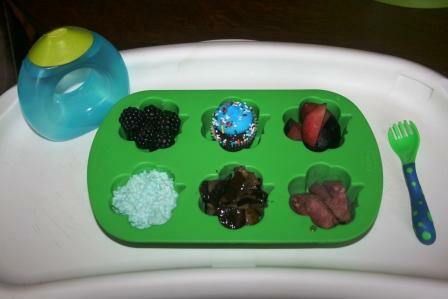 We had blackberries, a mini cupcake with blue frosting (disclaimer: not added to tray until he ate the other stuff! ), plum, mashed cauliflower with blue tinting, roasted eggplant, and ham. Want to participate in MTM? Okay, so what the heck is a chicken tractor? Paul has been hard at work on ours. 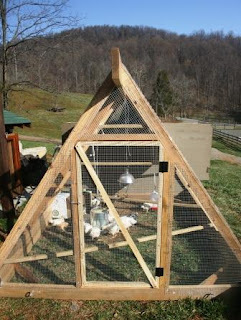 It's a big home for the chickens, that you can move around the yard each day (so you don't have to clean out a coop). I asked Paul why it was called a chicken tractor. He said because it moves. I wanted to know why it wasn't called a chicken train or chicken Mercedes but he didn't have an answer for that. 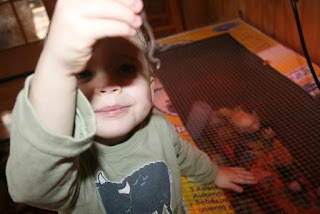 Pre-chicken tractor, the chickens were in our living room. Which was fun because we could give them treats throughout the day, like worms. But eventually the chickens got big. And smelly, and they started to run out of room in their box. So once the chicken tractor got close to completion, we moved them outdoors. See that wood overhang right over the door? I promptly stood up into that and just about knocked myself out. Paul sawed it off, thankfully. Right now, the chicken tractor is covered with insulation because it's cold out. Hopefully that won't happen again. Thanks for checking out my mtm post. I've answered your question under your question. Love your muffin tin this week, I got the theme wrong this time! Love your chook coop too! Eggplant was a good idea! I have never seen a chicken tractor before. Your tin looks great. Great chicken tractor. I found out it's called a 'tractor" because the chickens till, weed, and fertilize the soil as you move it along. So we'll have patches of green grass...nothing new for our yard. Roasted eggplant? Wow! Great meal! 2nd. wait. ok. so you move it around so you don't have to clean it out? um. do chickens poop? man. they just don't lay eggs? also. chicken tractor is a fine name. chicken humvee, pretty nice too. Your tin looks great and yummy. I've never seen a chicken tractor before!